Ignore Casio at your own peril. I’m going to start this review with a story about the Peavey DPM-3 keyboard. Say what?!? Well, you’ll see why. The DPM-3 came out in 1989 and I took an immediate liking to it, in large part because it had non-volatile, flash RAM so it could store its own samples (and the RAM was expandable to a whopping 1 megabyte! Well, it was 23 years ago). But it also had a very “analog” filter, and could transpose sounds over a wide range and still sound musical. Indeed, you can’t judge a book by looking at its cover. So if you think Casio can’t make a good synth, put tape over the name on the back, then get back to me. Casio has made quite the comeback, which became abundantly clear when I reviewed their WK-7500 workstation. I’d seen it at trade shows, thought it was pretty cool, and assumed the review would basically say it was a good consumer keyboard with a few pro features folded in. Instead, it’s more like a pro keyboard with some good consumer features folded in. It hits on all cylinders: Solid feature set, transparent operating system, arranger options (or what I call an "audio for video soundtrack generator"), a variety of fine sounds, recording/sequencing options, and a $499 street price. Amazing. Of course, some people on the internet ridiculed it and in true internet fashion, the most vocal critics had never tried it. “Oh, it couldn’t possibly be any good, it’s a Casio.” But then people who actually used it started to chime in, which helped set the stage for NAMM 2012. If you want to do some prep work, check out Casio's XW-P1 landing page for background info and specs. The list price is $699.99, but the street price is typically $500—if you can find one. I was fortunate to get one of the very first units, and it appears the “retail pipeline” hasn’t been filled yet. However, Guitar Center seems to have them, as shown on their XW-P1 web page with a “just arrived” banner. As is traditional with pro reviews, we’ll start off with a photo tour of the unit. But I have to admit that I’ve already plugged in headphones, and poked around the sounds. The XW-P1 can adopt an "analog" or "digital" character, and the step sequencer is extremely cool. It’s a very versatile synth that’s optimized for live performance, and it’s easy to get around on the buttons. And while the emphasis is on a combination of vintage and cutting-edge sounds, you can still find solid electric pianos, drums, and a wonderful drawbar organ. Of course, like any other product it’s not perfect; I could hear some stepping when sweeping the filter cutoff, the headphone jack is on the back, and the pitch bend wheel is just a bit smaller than I’d like—although its positioning with respect to the mod wheel makes it easy to do dual-wheel modulation moves that are killer for leads, so I can't complain too much. So here’s a preview of what to expect from the photo tour I’ll be posting tomorrow. I'm really looking forward to digging into this instrument in true pro review fashion--see you then! Note: Posts that contain attachments, like audio examples or patches, are shown with blue text to make it easier to find them as you scan through the thread. Thank you for the update! I hope to restore all the rich media examples at some point. Just adding a note for anyone finding this excellent, comprehensive review from an Internet search or directly via Harmony Central. 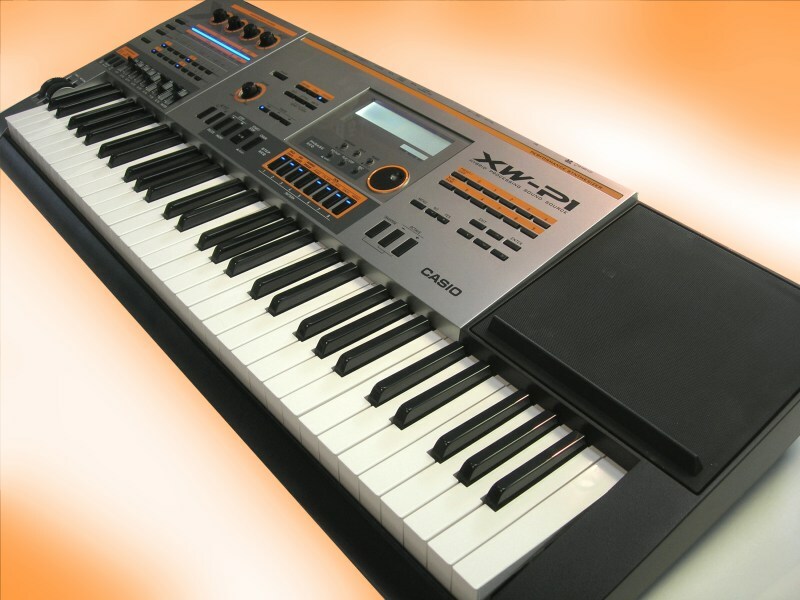 There are now a number of great, free resources for the XW-P1 on the Casio Music Forums (http://www.casiomusicforums.com) including many sounds, a FAQ and a document written by yours truly called "The XW-P1 Companion". Check it out. Last edited by AlenK; 04-11-2016, 07:10 PM. For what it's worth - I have been playing the XW-P1 into a Zoom G5 amp simulation/multi-effects unit that has a rotary speaker emulation and the stereo results are quite nice for the drawbar simulation mode with the XW-P1. I'm currently using a Fender Deluxe Reverb amp/cab simulation in front of the rotary simulator for the Zoom G5, and using the gain setting on the amp/cab for dirt. Way better overdrive sound than the in-built overdrive in the P1. I will try to make and post some recordings. I am most likely to purchase the P1 within the next few days. The seemingly fantastic feature set, great reviews and low cost have swayed me from purchasing a much more expensive synth ie Kurz PC3 LE, MOX6, Krome. This will be my second synth ever (I bought M-Audio Venom two years ago). I need more acoustic sounds (Venom has almost none) and hope the sequencer will help me as well. I have been reading reviews of the P1 for couple of and then found this one. Wow so much good info, tips, and excitement. I love my Venom but have joined a band and need more sounds. I was quite surprised to see so many mentions of the Venom in these pages! I can't wait to route the venom through the P1 as a sound input and to see what the P1's sequencer can do with it. Thanks for posting this great review. I'm just about to buy an XW-P1, in part because of what you've written (with help from Mike Martin). One problem: I can't see any links to any of the sound files that you mention in the review. It looks like you posted some piano samples, EP, Harpsichord, etc., but I can't find any links. I know this review was done 18 months ago, have you since removed them? Does anyone know if there has been a software update to give a better overdrive effect (asking primarily for use with the Drawbar organ mode).? I have a Roland VG-8EX and wonder what the audio/sonic possibilities are with the External Input on the Casio XW-P1. I love the VIO Guitar and HRM that are still unique to VG-8EX. If I play my VG-8EX through the External Input along with the XW-P1 preprogrammed synth patterns, how is the VG-8EX sound affected, or could it be unaffected at all? My first surprise was an "Osc On" button for the external input. Now, how could there be an Osc On for an External input? Well, I turned it on, and as I played the guitar, I could transpose it in real time from the keyboard. The fidelity wasn't exactly killer, but it had a sort of uniquely strange personality. In the audio example, the guitar did a lot of tonic/flattened 7th in the beginning. Except it didn't. The guitar was playing the tonic the whole time, and I loaded a phrase into the XW-P1 that transposed the guitar down to the flatted 7th. Hey Mike - are you proud of me for finding another use for phrases? Triggering guitar patterns! It's really late, and I need to get up early tomorrow. So, I'm not going to explain exactly what I did in this audio example, but I'll tell you it involved varying amounts of triggered envelopes, DSP ring modulator processing, delay, reverb, and some drum sequence I kicked in so I could do tempo sync triggering on the envelope and delay. Fun stuff!! Normally I wouldn't post something this raw, and I'm not even scratching the surface (just touching it lightly) but hey, I figure by the time we've hit post #327 I'm among friends. This is some pretty wild stuff...and I imagine it will be a lot wilder once I figure out how to tame it. I found a few more hidden "bonus" sounds, like the ones I described in my previous post (above this one). Apparantly channel 15 is in on the deal too, where Lead1 and Lead2 act like they have very short sustain. And on channel 13, Synth Bass 1 is a different type of synth bass. Here is something really interesting I found while playing the XWG1 as a GM sound bank. On channel 14 only, the GM patch called "Lead 1 (square)" acts like a real Casio synth patch, not just the boring old GM sound. Also on channel 14 only, the GM patch called "Lead 2 (sawtooth)" acts like a real Casio synth bass. All the other patches on channel 14 are just regular GM sounds, and no other channels appear to have this feature. It's very strange, but I'm glad to have these extra sounds. nope, but you can get a new M-Audio or On stage pedal for about $25. Thanks, I thought so. I even tried the trick where you hold the sustain pedal down while turning on the keyboard. That switches the polarity of the switch on some keyboards, but it made no difference here. I have a Yamaha damper pedal, and when I connect it to the Casio it gives me the reverse effect. That is, the piano sustains when the pedal is in the up position, and stops sustaining when the pedal is in the down position. Apparently the switch for the Yamaha pedal is "normally closed," wheras Casio is expecting a "normally open" circuit. Does anyone know if there is a setting some place in the Casio for this? Here's wishing everyone a happy and safe holiday season and a healthy, wealthy and productive new year!!! Now you all have a five day weekend to crank out some righteous tunes on your XW's so let's hear em! All times are GMT-6. This page was generated at 08:24 PM.